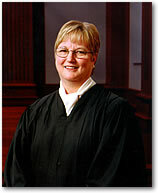 Christine Meaders Durham is a Utah Supreme Court Associate Justice. She was nominated for office by Utah governor Scott M. Matheson and assumed office in 1982. She is also a law professor. Durham was born on August 3, 1945, and grew up in southern California. She went to French schools when her father was an attaché with the U.S. Department of the Treasury at the Paris Embassy. She graduated from Wellesley College and the Duke University School of Law. From 1971 to 1973, she was a legal medicine instructor at Duke University Medical School. She also practiced general law and did title law and criminal defense work in North Carolina. She was also a legal consultant for the Duke University Center for the Study of Aging and Human Development. In 1973, she became an adjunct professor of law at Brigham Young University’s J. Reuben Clark Law School and in 1978 formed the law firm of Johnson, Durham, and Moxley. Two years later the firm merged with a larger Salt Lake City firm. She was an adjunct professor for many years at the University of Utah’s S. J. Quinney College of Law. She is an emeritus member of the Board of Trustees at Duke University. She began her judicial career in 1978 when she became a trial judge in the Third Judicial District Court. She was appointed as an Associate Justice of the Utah Supreme Court by Governor Scott M. Matheson in 1982 and became the Chief Justice in 2002 and served until she resigned in March 2012. She was also Chair of the Utah Judicial Council from 2002 to 2012. From 1986 to 1997 she was the President of the National Association of Women Judges, which she founded. She has been recognized for her work, most notably in 2007 when she received the William H. Rehnquist Award for Judicial Excellence, one of the most prestigious judicial honors in the country. She has served in many governing positions and has been honored for her work, including with honorary degrees from the University of Utah, Weber State University, Salt Lake Community College, and the College of Eastern Utah. She is credited for developing interactive educational programs in areas that did not previously have curriculum, including domestic violence, child witness testimony, and scientific evidence. Durham is a member of The Church of Jesus Christ of Latter-day Saints. She and her husband, pediatrician George Durham, are the parents of five children. This page was last edited on 2 July 2016, at 23:17.